Last weekend saw a highly successful two days for BRDC Members with Aston Martin Racing securing the Le Mans Series title and victory for Ralph Firman in the Japanese Super GT. Prodrive Chairman and BRDC Associate Member David Richards led the Aston Martin Racing celebrations last night at Silverstone after the marque secured the Le Mans Series championship title at the 1000km of Silverstone, 50 years after its World Sportscar Championship win. There were plenty of podiums throughout the classes with BRDC Members securing wins in all classifications apart from LMP1. 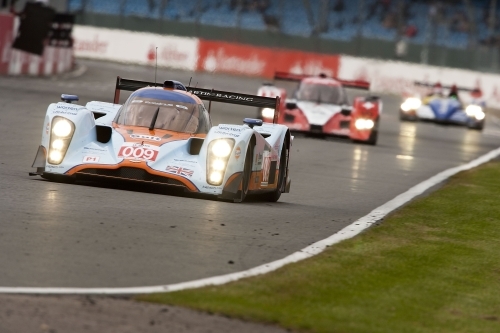 Jonny Kane was victorious in LMP2 and eighth overall in a Lola Judd while Mike Newton was second in that class and tenth overall. In the LMGT1 class Ryan Sharp was victorious in an Aston Martin DBR9 for Gigawave Motorsport and Rob Bell was in the Ferrari F430 GT which secured the LMGT2 class win. Darren Turner was the highest placed BRDC Member, finishing fourth in the 009 LMP1 Lola Aston Martin with co-driver Harold Primat. Superstar Andy Meyrick finished sixth in the Kolles Audi R10 TDI while Danny Watts was ninth. The Team LNT Ginetta Zytek of Lawrence Tomlinson, BRDC Vice President Nigel Mansell OBE and Rising Star Greg Mansell, finished in 28th after struggling with engine problems during the weekend. Luke Hines secured a third place in race two of the Formula Le Mans Cup at Silverstone yesterday. The BRDC Full Member just missed out on the podium in race one also as he finished fourth. Also out on track in the Formula Le Mans Cup was Charlie Hollings who was fifth in race one and seventh in race two. Ralph Firman was victorious in the Super GT round at Fuji over the weekend. The BRDC Full Member managed to avoid an early multi-car incident where he began quickly move up through the places before taking the lead on lap 25. Three BRDC Full Members made guest appearances in the Australian V8 Supercup at Phillip Island over the weekend. The weekend format saw two 14-lap races on Saturday and then a 113 lap endurance race on Sunday. Three time World Touring champion Andy Priaulx finished 16th in the feature race of the weekend on Sunday in the Bundaberg Red Racing Team Holden Commodore along with David Reynolds as his co-driver. Fellow BRDC Full Member Ben Collins was with the Jack Daniels Racing Team, also in a Holden Commodore, and finished 18th in the endurance race while BTCC and WTCC driver James Thompson was 21st. In the first 14 lap race on Saturday Ben was 13th and James 26th and in the second race James was 26th and Andy 28th. Sam Bird made a guest appearance in the British Formula 3 International Series in Portimao over the weekend and was on the podium having secured second place in race two of the weekend yesterday.